Last week I re-visited the Unisphere, an enormous open-air structure made of steel. This week I wanted to take a look at a somewhat similar endeavor a little over a century before the ’64 World’s Fair, Wyld’s Great Globe. Originally planned for the Great Exhibition of 1851 and for occupancy inside the Crystal Palace, the size and promotional aims of the globe precluded it from “official” involvement in the Exhibition. James Wyld was a map-seller, and he intended this project to grant him exposure through which to sell more maps. Funny that this would rule him out of consideration, given the “exposure-based” presence of different industries in the 20th Century World’s Fairs as the rule rather than the exception. 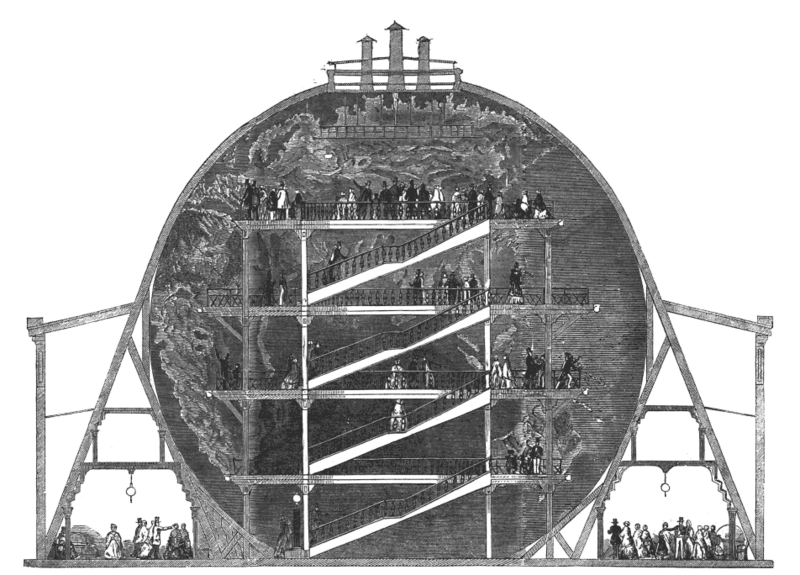 Wyld’s Great Globe was a sixty-foot-tall (and sixty-foot-wide, that’s how spheres work) hollow structure that invited guests to climb through its interior to see a map of the world. The maps were made using Plaster of Paris. By day the interior of the globe was lit by sunlight through glass panes, and by night it was lit by gas lights. Notably absent from the Great Globe was Antarctica, which was largely unknown at the time. The Great Globe enjoyed massive success when it opened alongside the Great Exhibition in nearby Leicester Square with a gallery of both Earth and star maps surrounding it. Attendance was second only to the Great Exhibition itself. Interest quickly waned, and in 1862, the components of Wyld’s Great Globe were sold for scraps. An unfortunate end to an inspiring idea.